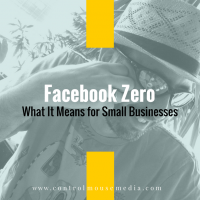 Facebook’s algorithm is undergoing a big change in the coming months, and it’s predicted to have a big impact on companies who rely on the platform – particularly small businesses. Why are they doing this? Given all the well-documented issues with Facebook – particularly over the past year or so – these goals are a step in the right direction. Though Zuckerberg has been short on detail (see his complete statement at the end of this post), it seems that he’s committed to at least doing something to “fix” Facebook. Listen to the episode here or subscribe in iTunes/Apple Podcasts. Starting a Business: A Case Example, where I pull back the curtain on my own business to help those who are just starting out (or thinking of taking the plunge). SEO for Small Business, a detailed look at SEO and my particular approach to it. As I previewed in “Facebook Is Headed for Trouble,” Facebook was testing some new changes outside the U.S. in late 2017, and now they’ve enacted these changes. Aside from the trolls, fake accounts, Russian ads, and other misinformation, the “core focus” of Facebook’s response seems to be their acknowledgement of the research “that there’s a direct connection between Facebook use and negative psychological impacts.” Quoting from an article that I reference in the episode, The Pros and Cons of Facebook’s Coming News Feed Changes – from a Page Perspective. My personal response is to use Facebook less. I published my detailed reasons why in a piece called Facebook Is Not the Place for Politics. 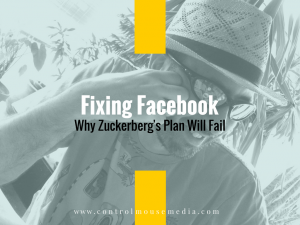 Despite all this well-intentioned effort, I think that Zuckerberg’s plan is doomed to fail. I’ll get into my 5 reasons why in the next episode. Published February 5, 2018 by Michael Boezi.